Much has been written about the Civil War, but how do we personally remember and commemorate this part of our collective past? How do historic places help us understand our own history? What kinds of places are worth remembering and why? 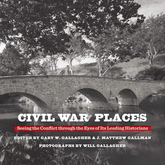 In this collection of essays, some of our most esteemed Civil War historians select a single meaningful place related to the war and discuss its significance. Included are meditations on a wide assortment of places—Devil's Den at Gettysburg, Hollywood Cemetery in Richmond, the statue of William T. Sherman in New York, and more. Paired with a contemporary photograph commissioned specifically for this book, each essay offers an unusual and accessible glimpse into how historians think about their subjects.